As rain falls, the tube floats up to indicate inches collected. Dimensions: Tube: 24"; Gauge: 6" x 3"
Weight: Resin: 1 lb. ; Copper: 1.3 lbs. This looks very pretty in our flowerbed. It's been sturdy enough that it doesn't lean. I do wish the numbers were a little bigger though. Big enough to see from my back door how much rain we have received . Sturdy enough that it stays in place and no glass to break if it freezes. Gave it to my mother is a gift for Christmas she absolutely loves it even looks good in the garden great tool does what it's made to do. Great little rain gauge. Works perfectly, easy to read numbers, love that it will weather into verdigris. Wondering how long to run your sprinkler? Not sure how much rain fell last night? Determining if your plants and flowers have gotten enough water doesn’t have to involve guesswork. In fact, it can be a work of art. World’s Coolest Rain Gauge is just what the name suggests—a clever tool that measures how much water your garden gets, either from rainfall or a sprinkler. It’s a functional instrument, plus it adds a fun, sculptural element to your outdoor space. Created by Moira “Mo” Clune, the gauge uses water displacement to measure rainfall. A copper flute collects the water, and a blue polycarbonate measuring tube with a calibrated float fits inside the collection flute. 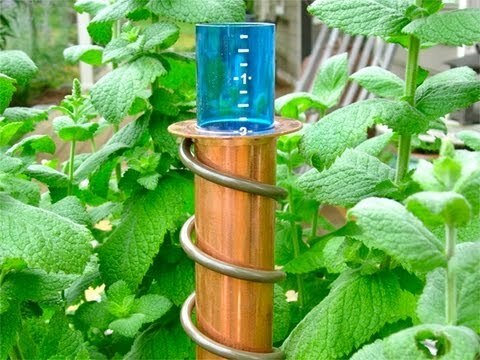 As water fills the copper flute, the blue tube floats up, displaying the rainfall measurement. Mo uses local sources (all the parts are fabricated within a 50-mile radius of her home base) and she makes each piece by hand in Gardiner, N.Y.
Keeping a steady supply of moisture in the soil is critical for flowers, plants and gardens. With World’s Coolest Rain Gauge, you can keep tabs on water levels with style.